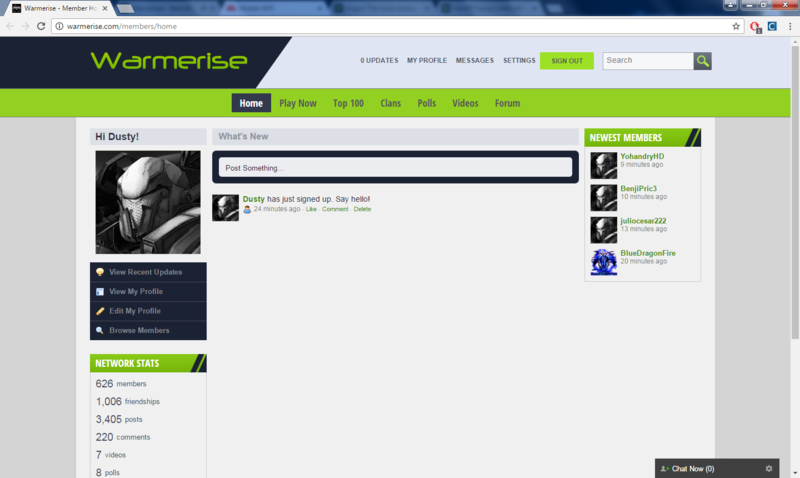 After almost 4 month of being offline Warmerise is finally back. 1. Warmerise has been ported to WebGL (a new alternative of Unity Web Player). Also it does not require any third party plugins, some browsers may not support it yet. 2. As promised, first 1000 registered users will get a bonus in form of 50 000 cash added to their profiles. To get it, login on site and then enter the game. The bonus will be added to your account. 3. Previeously users could only create 1 clan, to reduce number of spam clans. Regarding of new version of Warmerise, it's currently under development and is planned to be released this summer. I will be posting more update on that soon. It's good to be back, i hope this game will be so good as it was 4 monts ago. I just tried Mozilla, Google and Opera. Now I tested it on Google, supporst WebGL 1, not 2. Then I visited the link of WebGL 2 and I did see a spinning cube. The game just doesn't load in the middle at Play Now. Ignore this. I fixed it with some help. Update to each one of these browsers and it should work, I updated to Chrome 56 Beta and it supports it. Guys I press Play Now but nothing happens. Can someone help me? Am I the only one having low fps ? max ?? How do I solve this? I need help. Went on site and then i got this message: This browser supports WebGL2 But it is disabled or unavabile. Hey Max, I was one of the first 1000 registerd useers, but I did not recieve the currency. Can you please help me fix this issue? Once you register, you have to verify your email and join the game. That's how you get 50k. I need help. Went on site and then i got this message: This browser supports WebGL1 But it is disabled or unavabile. Hey Moderator, I registered on the 600th ish position (First 1000th) and didn't receive the cash. Already confirmed my e-mail, already logged in game (played 2 maps), tried on 2 different browsers (firefox and chrome). He did. I've verified it with him, and with another friend of mine. New users aren't getting 50k.